Country Joe Flint's career in radio began in 1968 when he attended a San Francisco broadcasting school. Next, he returned to Salt Lake City where he worked at the University of Utah's KUTE and KUER radio stations on campus. His first paying job in broadcasting came through KABI in Abilene, KS, but Salt Lake City beckoned again and he returned for a part time job at KRGO in 1969. Shortly thereafter, he was offered a full time job at KBBC in Centerville, UT. A little over a year later, a friend suggested he contact KSOP. In May, 197l, he was hired by KSOP and "Country Joe" was born. He started out in the evening slot and then moved to morning drive. In his first year there, he was voted the most popular Country DJ in Salt Lake City and won a trip to the DJ convention in Nashville. Over the years, he's received more awards and recognition than any other DJ in country music in the intermountain west. Joe has served as Program Director, Music Director, and Production Director along with his regular air shift. He still prefers on-air work where he welcomes the chance to break new acts and country sounds. He was a Top Five finalist for Billboard's 1987 "Country Program Director of the Year" and he's a five-time Top Five finalist for the CMA and ACM "Country DJ of the Year" and "Broadcast Personality of the Year" at the CMA. He served as Honorary Chairman for the Diabetes PRCA Rodeo for 13 years, organizes and hosts local talent shows for the Utah State Fair, the Salt Lake County Fair and others. He's co-hosted TV fundraisers for PBS, the March of Dimes, MDA Easter Seals and others. He was a judge for the Nashville Network's "You Can Be A Star;" received the Utah Fraternal Order of Eagles Humanitarian Award and starred in a Gold Award winning TV commercial. He's co-authored "The Almanac of Country Music" and "The Insider's Country Music Hand Book," fact-finding books used by country DJ's and fans worldwide. He and his family have operated Country Joe's All Country Music and Karaoke Store in Salt Lake City since 1981. From 1991 to 1993, he produced and hosted "Country Joe's World of Country Music," a weekly country music video TV show. From 1996, he's produced and hosted "CJ's Karaoke CafÃ©," a local TV show that showcases local karaoke singers of all ages. Sporting his trademark hat with the hatband that reads, "Made In the USA," Country Joe Flint says he "believes in promoting country music in every aspect that I possible can. As long as I can get up and around, I'll be involved in country music." 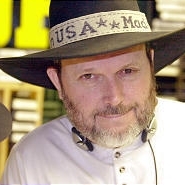 Country Joe Flint was name to the Country Music DJ Hall of Fame in 2001.